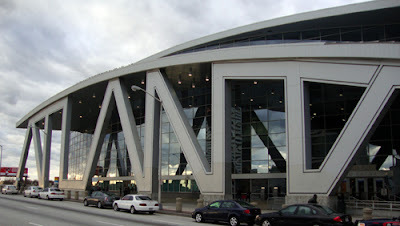 The Phillips Arena building is unique in Atlanta in that it actually bears the name "ATLANTA" within its facade, in the biggest letters I've seen in any other building in the city. When I lived in Washington, D.C., I heard the city called by visitors as "the city where everything is carved in stone." An accurate observation where architecture is concerned...many of the city's buildings do indeed have names and quotes engraved into them (fortunately because of our democratic voting system, not 'everything' is carved in stone). But I do not recall a building with such a prominent namesake incorporated into a D.C. structure, as it is at Phillips Arena. Phillips Arena is home of the city's hockey team the Atlanta Thrashers, named for the Georgia State Bird, the Brown Thrasher, as well as concerts and special events. And the Thrashers have what I think is one of the coolest uniforms in the NHL, but maybe that's a biased opinion. Not at all biased, hockey is one of the most exciting sports to watch live and Phillips is the place in Atlanta to catch that action.